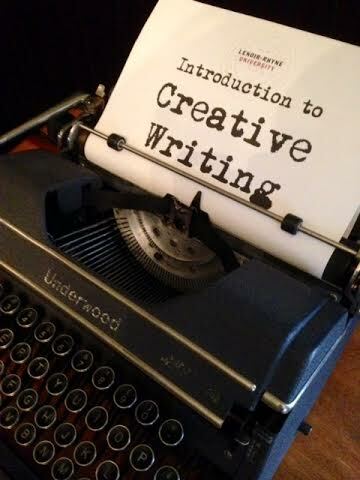 Step One: Type title of course in vintage typewriter font. Step Two: Print title on letterhead. Step Three: Roll letterhead onto platen of Underwood typewriter. Step Four: Photograph typewriter. Step Five: Post photo to course blog page. And so I began last Tuesday . . . two sections of ENG 281: the first creative writing course I’ve taught since 1999 and my first ever multi-genre classes, featuring not just fiction, but also creative nonfiction, poetry, and one-act plays. I hope they turn out as well as the window dressing. Beginning to explore your syllabus by reading one of my favorite writers’ – Atwood. Thank you for posting. I’ll take my time and explore this. Hope you’re doing well and enjoying N.C. Thanks, Lenore–and thank you for your earlier comment on the Atwood-and-Paley post. I am doing well and enjoying North Carolina. I hope all’s well with you in Richmond. Hi Jane, I had a long email from Jamie Fueglein today. Maybe told you that he’s editing my 4th novel ms. ? He has been a great help. A good teacher. Close to the end of editing, I hope. Will be looking for an agent – ugh. My writing group has started a “salon” that will probably meet every other month or quarterly. Each time one or people will be responsible for topic. This time it’s on “scene” and we have links about scene to read and discuss. In case we finish early, I’ve also submitted quotes of conversation that show emotion and raise tension. I picked 4 favorite writers. Fun skimming and choosing the best. Are you writing for yourself these days?